I am reposting this article as it’s pretty interesting and my new readers may have missed it. Who would have thought of the slate acting as a kind of natural storage heater for the vines? Not that you can get juice from crushed slate, but the image definitely evokes the focused, flinty character of rieslings from the Mosel. In this most northerly of wine regions (it’s at 50° latitude; the latitudinal range for wine growing is 28°-50°) the bits of slate that litter the vineyards store the sun’s heat, transferring the energy to vines which would otherwise lose the will during the cold night hours. 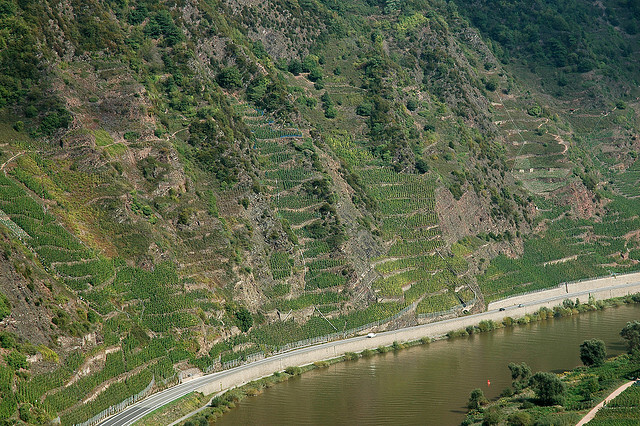 The Mosel river itself also helps to nourish the vines, reflecting the sun on to the slopes and providing that extra bit of warmth that encourages the vines along.